Yes, Carrypad wasn’t a product of the iPad boom. It started on paper in late 2005 as my phone contract renewal time was approaching. I had a boring job and I spent quite a few hours thinking about what I really needed. I was already using Internet data over GPRS on a daily basis and was wanting more. More screen, more flexibility, more battery life and more processing power. There wasn’t a phone on the market that could satisfy my requirements. Convergence wasn’t happening. The simple fact is that you’ll never get everything on one device. It wont happen until we evolve better eyes and smaller fingers. I’m still no fan of all-in-one convergence. There’s the third device requirement popping out now – Sofa, Bed, Car. sofapod, stylepod, stylepad, lifepad, lifepod, midipod, midipad, intermidi. Mmm. Those names are all to obvious. Lets try Carrypad. Yeah we’ll call it the carry-pad. And at that point in writing the draft posts I registered the domain and set up the blog. The Carrypad Journal went live 5 years ago today. I wasn’t the only one thinking about this category though. There were other bloggers around and, unknown to me, a project within Microsoft called Origami was about to go public. The Origami team, led by Otto Berkes, had been tasked with putting forward requirements for the next generation of personal computer. They came up with a social, location-focused sharing device proposal and a demonstrator called Haiku. [See this article for a retrospective.] It was so ahead of its time that it beat technology by about 4 years. When Microsoft tried to implement it they had no operating system, no processing platform efficient enough or powerful enough and radio technology was too power-heavy. The mobile devices â€“ Origami UMPCs â€“ were dismissed as ugly, useless ‘tweeners.’ Many, many journalists missed the point of the project, called it a complete failure and ignored the space. What actually happened is that Microsoft hit the nail on the head with the project and should have kept it secret for another 4 years while they developed a matching operating system. They still haven’t done it even today, 5 years later. Instead, others have stepped in and are making a success of it. 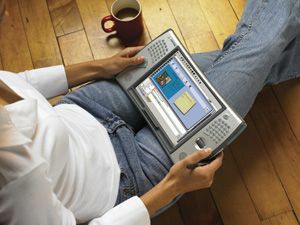 Other significant mentions need to go to Pepper Computing â€“ Their PepperPad was a concept that was also far too ahead of technology. Nokia had the Linux-based 770 too. They recently lost their way with that one! Despite the negative press that the sector was getting, I carried on blogging and found a niche, a big niche of pro-mobile passionate users that enabled me to leave my job and go ‘pro.’ These users and fans still exist today and not just in vertical markets for transport, health, ‘blue-light’ and other industries. You’ll find them over at UMPCPortal which was the detour I made with Carrypad to keep up with the buzz of the UMPC. I’ve learnt a lot from these people over the years and despite falling viewer and story numbers there, find it difficult to focus completely on the consumer tablets without going back to UMPCPortal for a ‘pro’ chat every now and again. I would have gone bust in 2008 had it not been for the netbook though. Thankfully, the wave of real sales, millions of sales, helped advertising revenues and propped me up. It also helped that many netbooks were being called UMPCs in Asia. 2008 was a big year for traffic. Two days before the first person started queuing for the iPad my wife gave birth to my Son Nicklas and my world was turned upside down. I wanted to write 24/7 about tablets and consumer tech. I wanted to go to every meeting and event possible. I had more plans than ever for Carrypad. I also wanted to spend time with my family. It was a hard time trying to get the balance right and the last year has been the toughest yet as I try to balance my passion for ‘Carrypads’ and give time to my Family. Funnily enough, the products I cover have helped and there’s one product that, more than any other, tells me that I was right. The Samsung Galaxy Tab is the Carrypad! So that’s where I am now. I’m at a point where family life is getting easier to cope with, where I’ve got a device that satisfies my original requirements and where I need to start thinking about the next big thing. I’ve got the wrist in my head right now but disruptive technologies like foldable screens, solar power, voice control and superphones will all put a spin on it. I’m also looking closely at operating systems that could potentialy span the fun, app-centric and location-aware mobile space to the pro-focused desktop space. Independent blogging is getting hard though and it’s tough to see a future where I can continue as I have done over the last 5 years. Twitter has cheapened the process of cross-linking and getting friendly traffic, large blog organisations are increasingly working inside their own walls and spammers and content copying add another challenge. The plan right now is to put more effort into my white-labeled product database on which I can build a blog that doesn’t rely on advertsing. I want create a new forum on Carrypad and will continue to arrange unique content through my contacts. Running two websites (actually three or more if you include my minor projects) is also inefficient and so it’s likely that I will combine the two soon, maybe under a new, generic name which would release the domain Carrypad.com for a sale. To be honest, now that the ‘pad’ market has taken off, I don’t want to be confined by it. The market will evolve and so must I. Where could we be in another 5 years? Thank you to everyone that has contributed to the success of my web projects over the last 5 year. From Paceblade for trusting me with my first review device through VIA Technologies who sponsored my solar-umpc tour. Thanks to Jeff Moriarty for reaching out when he worked at Intel. That relationship continues today. And thanks to the readers. Thanks to the people that correct my terrible spelling. Thanks to the people that challenge my opinion. Thanks to the people that add knowledge and thanks to the people that help others via comments and forum posts. Thanks to other tech bloggers that have been so helpful, generous and friendly.